If you’re unfamiliar with skin peels or chemical peels, the term itself could send you running in the other direction. It certainly doesn’t sound like something you’d want on your face, right? Wrong. The biggest misconception is that chemical peels will burn the skin leaving it sore, red and painful. Unless you opt for harsher salon treatments this couldn’t be further from the truth. Try forgetting the word ‘peel’ for a minute and instead think of them ‘lifting’ the grime, ‘fizzing away’ dead skin, and ‘plucking up’ congestion. That’s better isn’t it? Chemical peels are a great solution for a range of skin concerns, from wrinkles to acne to hyper-pigmentation. The treatment stimulates new cell growth and collagen production, helping to reveal fresher, clearer, brighter skin. So if you’re in search of a way to get brighter, clearer, more youthful-looking skin, a chemical peel could be the answer. 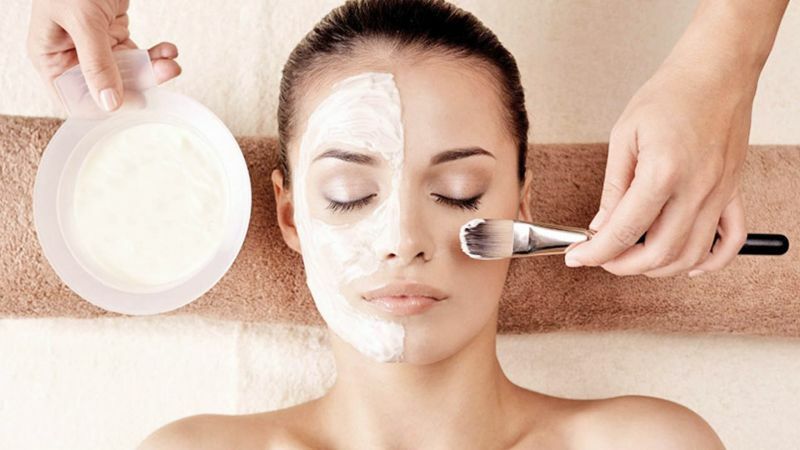 Chemical peels and skin peels are cosmetic treatments that can be applied to the face, hands, and neck. They’re used to improve the appearance or feel of the skin. 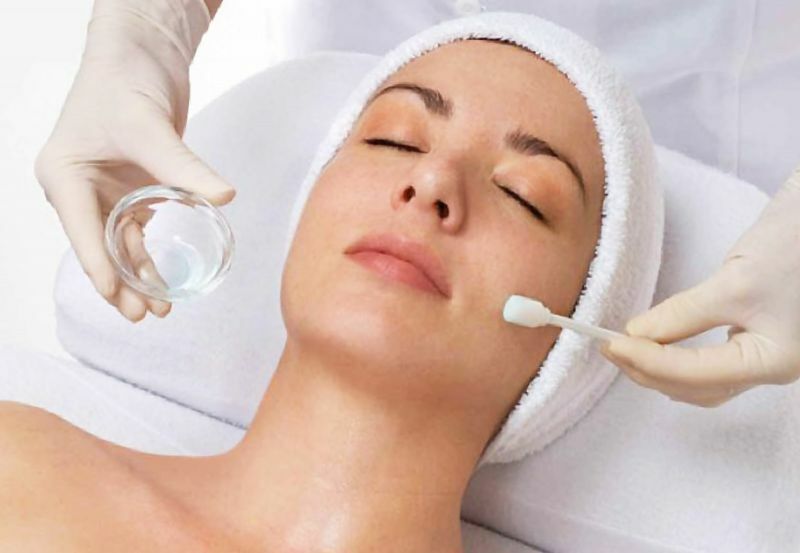 During this procedure, chemical solutions will be applied to the area being treated, which causes the skin to exfoliate and eventually peel off. Keep in mind that not all chemical peels are the same. Some treat surface skin issues and others address concerns originating in the deeper layers of skin. You’ll want to consult a qualified, experienced practitioner to determine which type of chemical peel is best for you. Once you’ve determined the right one, prepare to love the results as a skin peel is an effective and very safe procedure. Glycolic acid is alpha hydroxyl acids (AHA) commonly known as fruit peel. Its benefits had long been recognized when Polynesian women used sugarcane juice that contains GA in their beauty regime. Glycolic acid specifically helps in decreasing the pigmentation and hydrating the dry skin;thus is the perfect choice for non-sensitive dry and combination skin types. Lactic acid has been in the use of skin care for ages; the much-celebrated beauty icon Cleopatra use to apply sour milk that contains lactic acid. Lactic acid is AHA, but much milder than the glycolic acid, thus preferred for sensitive skin types. Mandelic acid will give less overall irritation and inlamation when compared with other AHAs, which is beneficial for those who have sensitive skin. In addition, it has an antibacterial effect on the skin, which makes it a viable choice for those with acne-prone skin who want to have a chemical peel. Salicylic acid is beta hydroxyl acid that has the unique ability to seep into oil secreting glands and dissolves the oil secretions and help loosen the clogs plugging the opening of these glands. Thus, salicylic acid peels not only sheds dead skin cells but also reduces oil secretions, black/white heads, pimples and open pores. No doubts it is preferred for oily skin types. A high-performance treatment to refine, renew, brighten, lighten, tighten, smooth, stimulate, calm and hydrate the skin. This experience is built around a professional chemical peel exfoliation. Your appointment starts with an in depth consultation that will later help your therapist address your unique skin concerns and tailor the treatment to suit your skin’s individual needs. Please let your beautician know your areas of concern: aging, dehydration, acne, congestion, pigmentation etc. The Skin Peel Luxury Custom Facial is a comprehensive treatment that uses deep cleansing to unclog pores and remove dead skin cells and debris, exfoliation using a chemical peel solution to renew the surface of your skin, and a specialty mask to to tighten and brighten the skin, remove toxins,soften and smooth the appearance of fine lines and produce a lasting youthful glow. This facial combines the effectiveness of a chemical peel and quality skin products with an intuitive touch allowing you to unwind into a peaceful state. Our results-oriented and custom-tailored approach to your skincare needs will leave you feeling confident and glowing. Deep cleansing to unclog pores and remove dead skin cells and debris followed by professional skin peel exfoliation. We end our treatment with hydration and protection against premature signs of aging with natural moisturiser or serum to keep lines and wrinkles, hyper-pigmentation, and dark spots at bay. 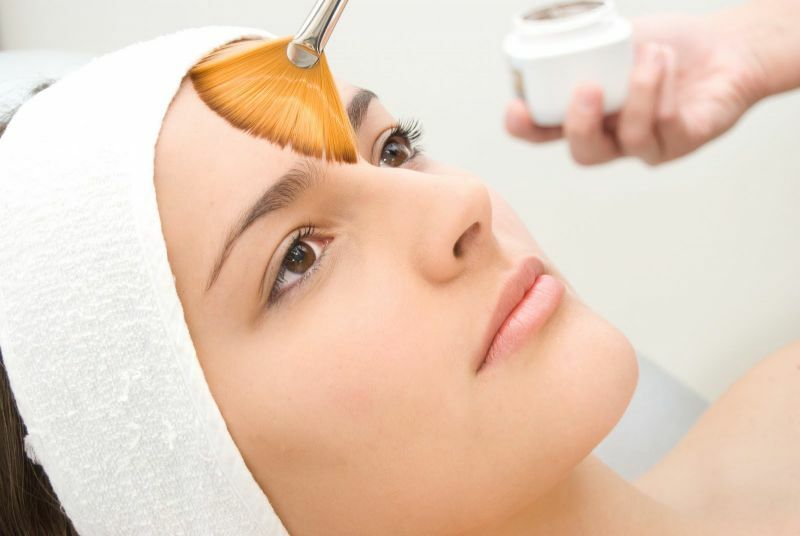 Who is a good candidate for Skin Peels and what are the contraindications? 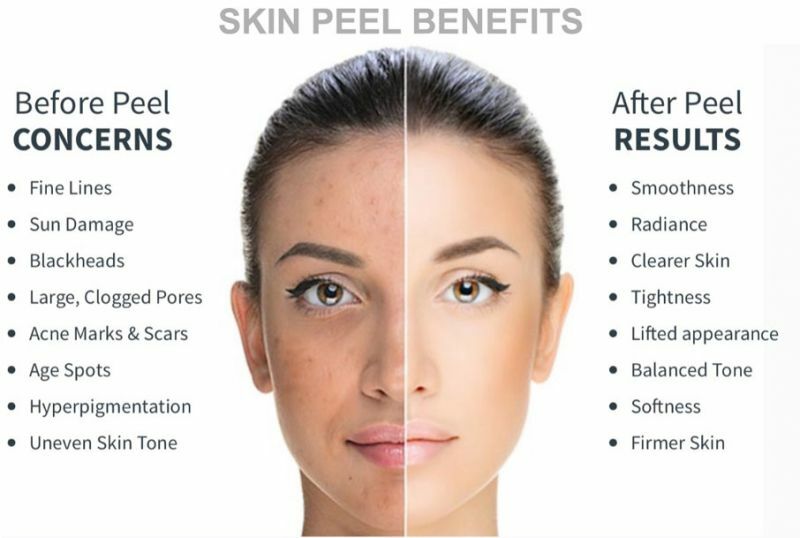 Everyone can benefit from a peel, whether you want glowing skin or smoother texture and if you suffer from particular skincare issues like acne, a peel can work wonders for you.They are often even gentler than traditional scrubs which can be very abrasive, particularly if you suffer from sensitivity. 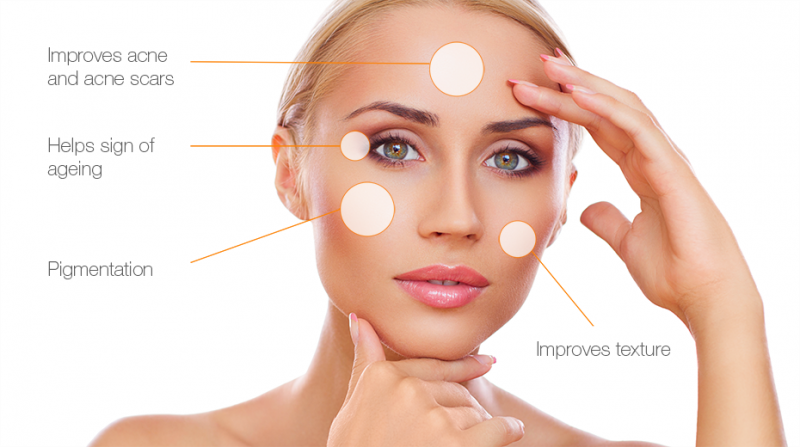 Some medications and health conditions don’t pair well with a chemical peel. If you are using or experiencing any of the following contraindications, adhere to the timelines as stated. 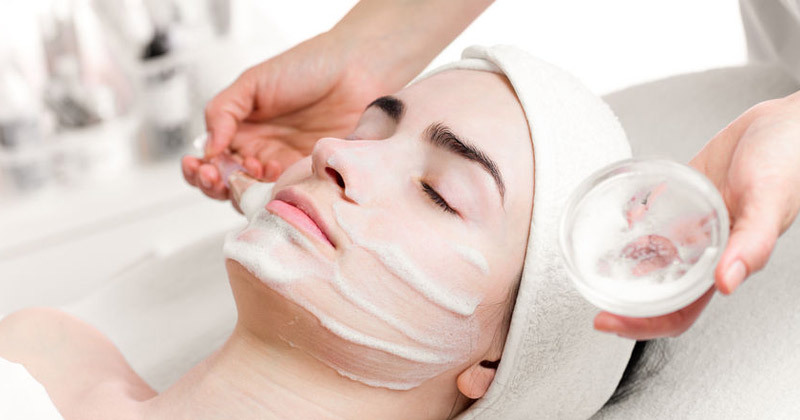 What is the aftercare for a Chemical Peel Facial? Do not use any skin care products that have not been approved by your aesthetician. Avoid direct sun and extremes of heat or cold. ​This includes tasks such as gardening, cooking over a hot stove for a long period of time, exercising, swimming, sitting next to a bonfire or fireplace, hot tubs baths. Discontinue use of any AHA products for 72 hours, or 6 weeks if doing a treatment cycle. Client may continue their regular skin care routine after 72 hours . Use Sunscreen. Clients should never go out even on a cloudy day without SPF30 sun protection if they do peels. You’ll see the results of a superficial chemical peel when your skin heals, generally within two to three weeks. Generally it is best to get a peel every four to six weeks. But if you suffer from acne there are some peels that you can do every two weeks until you get the results you want. Generally it is a great idea to buy a series of four or five peels up front so that you can achieve the treatment results that you want.